$31.46 $34.95 As Low As $0.47 ea. 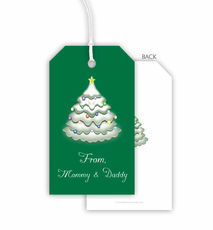 Add your personal touch to your Holiday gifts with this set of paper gift tags. Sized 3.5" x 2". Your choice of design color. Flat printed in ink color and typestyle as shown. Positioning only as shown. 12" string length is included but not attached. Wording "Merry Christmas" will always appear as shown.